The wording of the political clause in the document is similar to the wording used in Netanyahu’s previous government in 2009 and 2013. Although there is no apparent change in the wording of the diplomatic clause as they have appeared in Netanyahu’s past government lines, there is a difference: Israel’s international standing and the fact that since its last election period, the U.S. and the European Union states have demanded that Netanyahu prove – both in policy and in action – that his government is committed to the two-state solution. Whether the explanation is convincing or not, neither the Telegraph nor New York Times editorials added the historical context provided by Haaretz. Notably, Haaretz itself did not go far enough in its context. Looking back at Israeli government guidelines for the last twenty years, it is evident that the current guidelines are not unique. In fact, no Israeli government, either from the left or the right, has ever stated an unequivocal policy of creating a “Palestinian state” in its guidelines. The Government will strive to shape the permanent borders of the State of Israel as a Jewish state, with a Jewish majority, and as a democratic state, and will act to achieve this through negotiations and agreement with the Palestinians – conducted on the basis of mutual recognition, signed agreements, the Roadmap principles, cessation of violence and the disarming of the terror organizations. The Government will strive to conduct negotiations with the Palestinians in order to shape a new reality in our region. However, if the Palestinians do not act accordingly in the near future, the Government will take action even in the absence of negotiations and agreement with them, on the basis of a broad national consensus in Israel and a deep understanding with Israel’s friends in the world, primarily the United States of America and President George Bush. Israel’s territory, the borders of which will be determined by the Government, will entail the reduction of Israeli settlement in Judea and Samaria. Should practical political negotiations include the establishment of a Palestinian State, the topic will be discussed and decided upon by the Government. The Government will act to accelerate the negotiations with the Palestinians, based on the existing process, with a view toward ending the conflict with a permanent settlement that guarantees the security and vital interests of Israel. 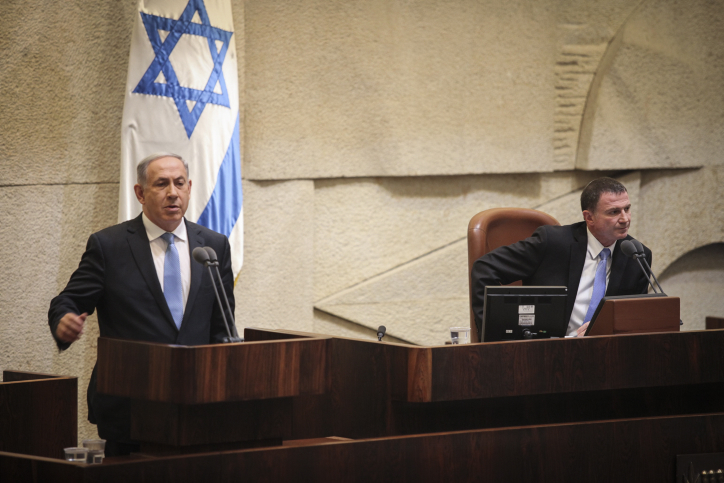 The permanent settlement with the Palestinians will be submitted for approval in a referendum. In short, the last six Israeli Governments, even when undoubtedly supportive of the peace process, did not use the explicit terms “two state solution” or “Palestinian state”. In failing to note that the current government’s guidelines were not unusual in this regard, readers are misled to believe that the government guidelines were indicative of an important shift in policy. 1996- The Government of Israel will propose to the Palestinians an arrangement whereby they will be able to conduct their lives freely within the framework of self-government. The Government will oppose the establishment of a Palestinian state or any foreign sovereignty west of the Jordan River, and will oppose “the right of return” of Arab populations to any part of the Land of Israel west of the Jordan River. 2015 – The government will advance the diplomatic process and will strive for a peace agreement with the Palestinians and with all of our neighbors, while safeguarding the security, national and historical interests of Israel. If an agreement of this kind is reached, it will be brought for the approval of the cabinet and the Knesset, and if necessary, for a national referendum as well. The comparison makes clear the important story that The Telegraph and The New York Times missed. Instead of focusing on the politically meaningless “omission”, the papers could have focused on the radical change that Israeli politics have undergone between the first and current Netanyahu governments. Of course the lack of dedication to a 2 state solution in the charters of Fatah or Hamas needs no comment from the Telegraph. There has been no new government of the PA to make such statements for the past ten years and the one ten years ago similarly failed to declare this ambition. And this is any of the EU’s and Obama’s business because … ? Oh, I forgot, these are JEWS. They’d better tug their forelocks and look down at the ground when they speak to their betters. And Haaretz happily joins in this antisemitic narrative. Despicable cage-liner. Abbas has repeated called for a one state solution, whereas there is already a two state solution. A state on each side of the Jordan River.